All of Grace Continent will be decked out in Halloween decorations from the 24th October to 6th November..
Acquire the new Crimson Masquerade costume and a new pumpkin helmet, Jack’s Helmet. Players will also be able to unlock a new hero, acquire the legendary Eternal Mirror, or ride around in style on the Witch’s Broom. Shanghai, China. 24th October 2018 ---- Halloween in League of Angels III is starting early with the Haunting Eve festival, lasting from the 24th October until 6th November. Watch as all of your familiar places are decked out in Haunting Eve style Halloween decorations, and a new Halloween-themed costume, hero, mount, and various items. From 1st to 5th November players will have the opportunity to dress up as a vampire or witch with the Crimson Masquerade costume by participating in Haunting Eve events. A brand-new legendary offensive hero, Omen the headless horseman will also be available as a featured hero for players to unlock during this period. At certain points throughout Haunting Eve, players will be able to get in the Halloween mood with new spooky items. By continuously logging in and completing tasks around the event players will be able to run around with pumpkin headgear, Jack’s Helmet, or swoop across the world on a new mount, the Witch’s Broom. 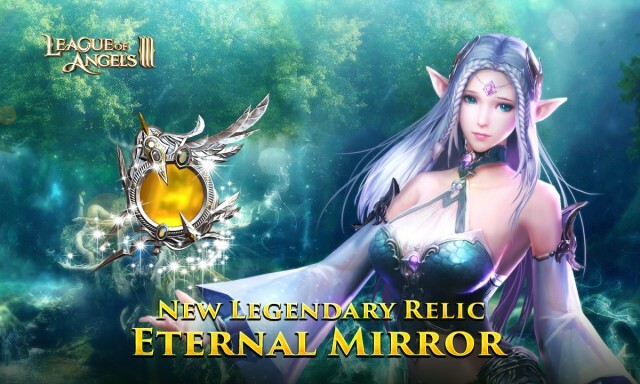 The legendary relic, Eternal Mirror, will also be available for players to obtain, a wondrous item that can heal all other allies after any ally dies. League of Angels III is free to play on the GTarcade website (https://loa3.gtarcade.com/) as well as on the GTarcade Desktop client. Keep up with all the latest news and updates following the official page on Facebook (https://www.facebook.com/LeagueOfAngelsIII/). Last: Put on Jack’s Helmet and Fly around in Witch’s Broom! Next: Update V3.6.0: Get Ready for Haunting Eve!